Comfort food isn’t always hearty soups, pastas and stews. I think we can all agree that french fries have lent a comforting touch occasionally and that pint of ice cream didn’t hurt either. Comfort food is relative but there are a few staples like mac n’ cheese and dishes mom used to make that really hit home for us as individuals. 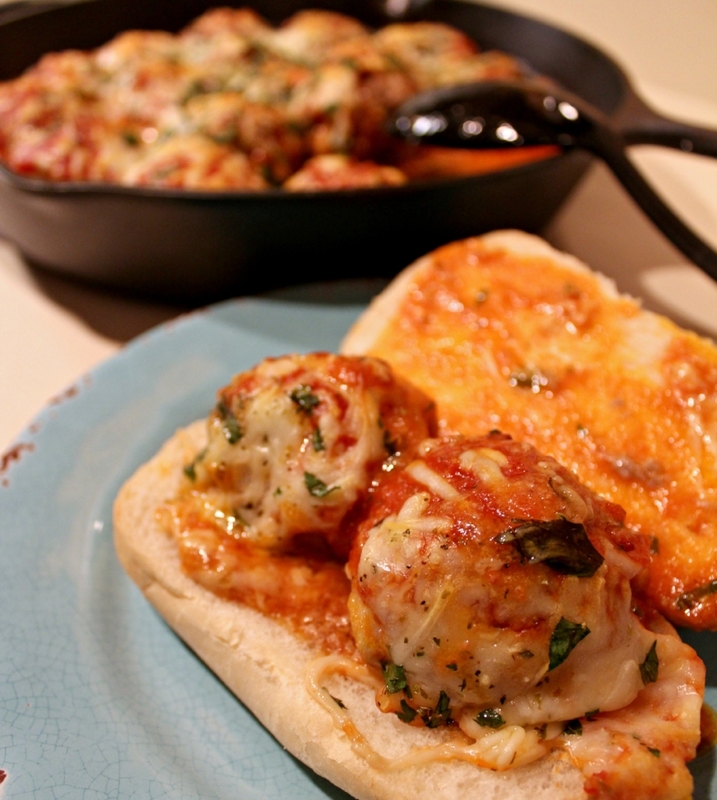 Meatball sandwiches don’t have a particular memory for me but they do satisfy a craving every once in a while. They’re also pretty easy to make. I love their sauciness and all the cheese. I mean, who doesn’t love cheese? 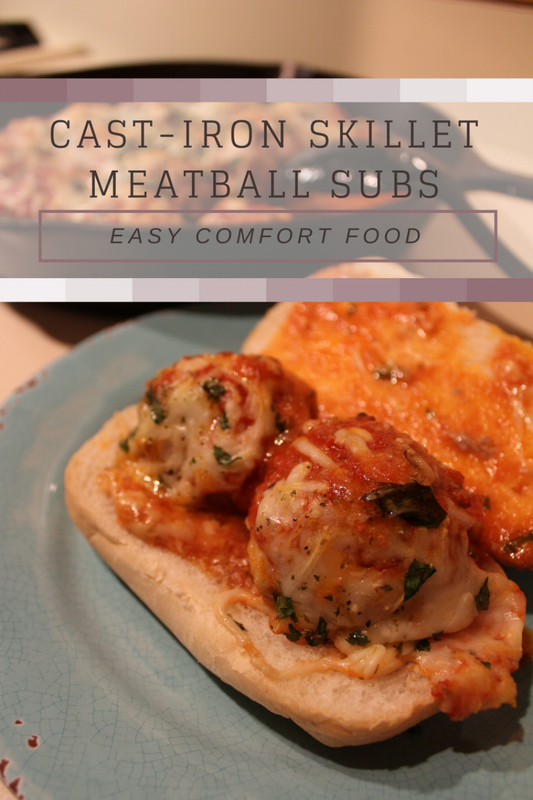 When I found myself craving a meatball sub, I also wasn’t interested in any crazy clean-up. So instead of making them on the stove or in the oven and cooking the sauce separately, I threw everything together in a cast-iron skillet. It provides even cooking for the meatballs and I cleaned up the two dishes I used to prep the meatballs while they baked in the oven. It’s a pretty basic recipe using an even ratio of beef to pork. You could also include ground lamb or veal for an even more traditional meat combination but the pork and the beef worked fine. You’ll see those memes on social media saying something along the lines of “real Italians don’t use jarred gravy.” Well, this real Italian likes to whip up dinner with as little work as possible once in a while. Normally, we’ll make large batches of gravy (aka, marinara) and freeze it in individual bags for later use but when you’re fresh out, there is nothing wrong with jarred marinara. I will shamelessly buy a few at the grocery store to keep in the pantry for emergencies. It’s a matter of convenience and survival and if fellow Italians are going to judge, I’d question their claim of never once using jarred gravy. Making it from scratch takes a whole day! Sometimes you just don’t have time for that. Am I right? 1 - Preheat the oven to 400 degrees. In a small skillet, heat the olive oil. Saute the onions and garlic, about 6-8 minutes, until softened. Set aside to cool. 2 - In a large bowl, mix together the meat, onions and garlic, eggs, breadcrumbs, herbs and spices, parmesan cheese, salt and pepper to taste. Mix well and roll into 1-inch balls. 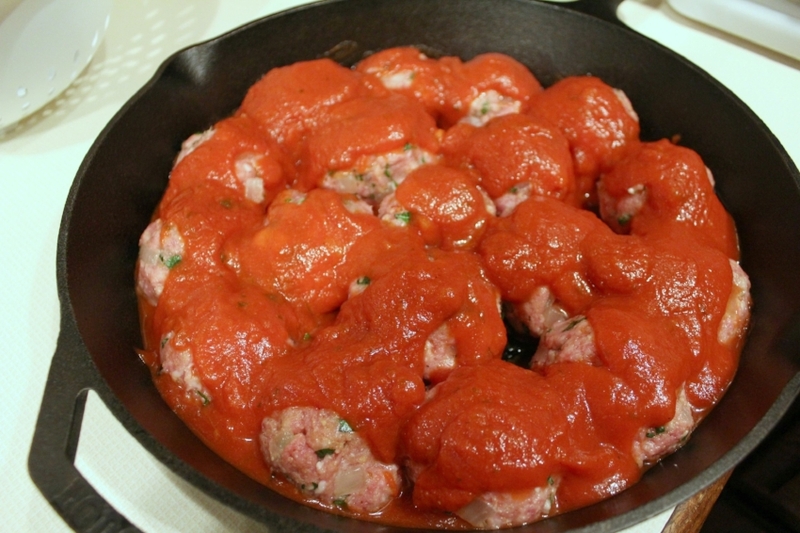 3 - Spoon about a quarter of the marinara into the cast-iron skillet. 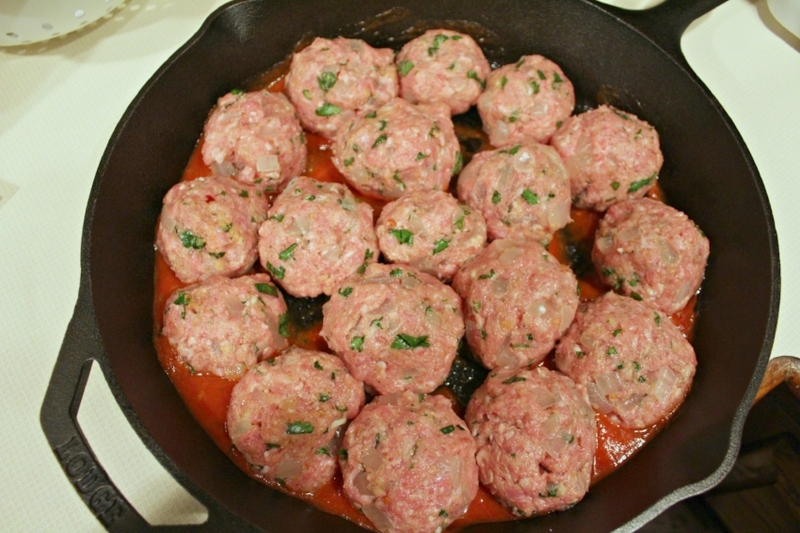 Add the meatballs until they are nice and snug. Pour remaining marinara over them. Top with cheese and bake 20-25 minutes until the meat is cooked and the cheese is bubbly. Serve on sub rolls.